Today’s recipe is one of the BEST things I have eaten in a long time. I found it on the popular blog www.twopeasandtheirpod.com and thought it tied in nicely with this months Real Simple magazine feature about “health bowls” – combining fresh salad ingredients with unexpected flavors and grains. This Asian Quinoa Salad features some of my favorite ingredients, the only thing missing is potato chips. Because potato chips are amazing. I diverted from the original recipe and added some roasted unsalted peanuts for some extra crunch, and used my nifty food processor on the grater setting for the cabbage and carrots instead of chopping by hand. This delightful recipe tastes amazing for several days in the fridge and would be a popular potluck dish. And need I say VEGAN. And that is worth celebrating! Boil 2 cups of water then add 1 cup quinoa, cover and turn down to simmer for 15 minutes. Remove from heat and fluff with a fork. 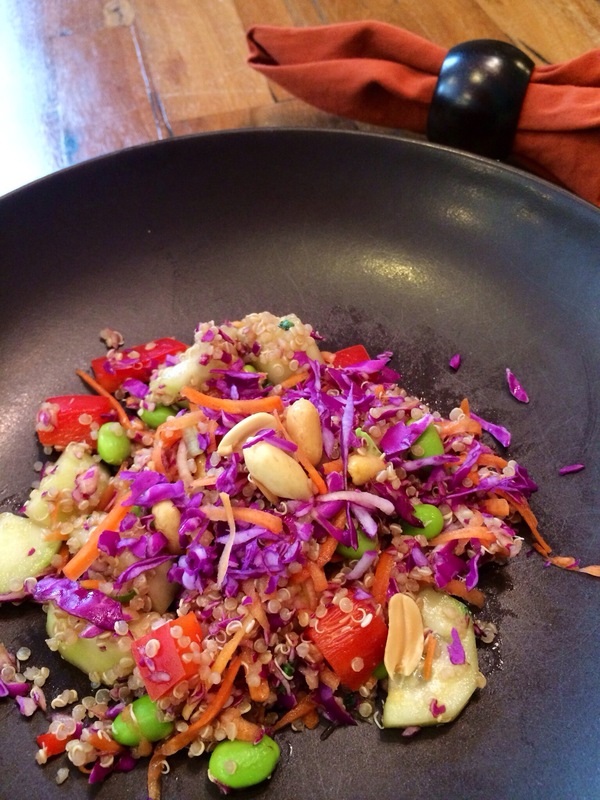 Place the quinoa in a large bowl and add the cabbage, edamame, red pepper, peanuts, carrots, and cucumber. Set aside. In a small bowl, whisk together the soy sauce, sesame oil, rice wine vinegar, green onions, cilantro, sesame seeds, ginger, red pepper flakes, salt, and pepper. Pour the dressing over the quinoa salad and stir to combine.